April is Arbor Month and the City of Portland and Hoyt Arboretum are sponsoring a host of fun and free events, tours and volunteer opportunities around the city. Check out these listings to learn more! Here's your opportunity to see the urban forest canopy from a bucket truck! Portland Parks & Recreation, Urban Forestry will be offering free bucket truck rides in Chapman Square for 2 hours around lunch on a Monday. Visit during your lunch break, learn about Urban Forestry and see the world from a different perspective. Kids over 48" are welcome. First come, first served! 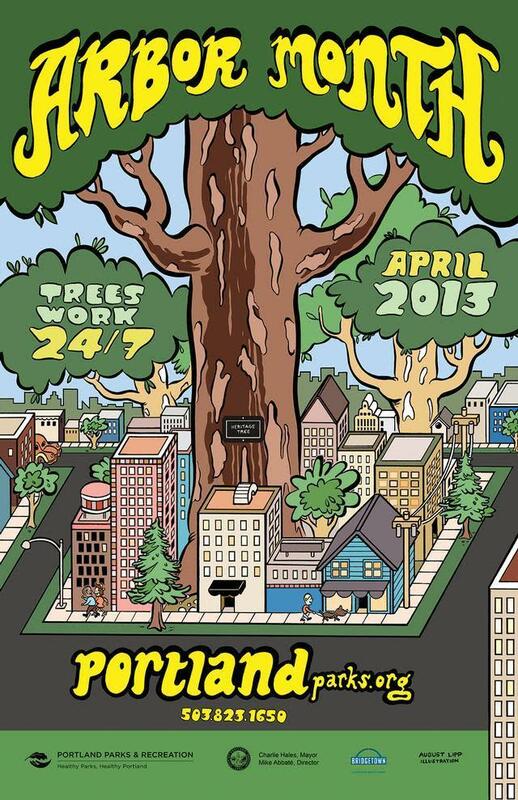 Learn about Portland's Urban Forest in a lecture by Larry Maginnis, Urban Forestry Supervisor. Maginnis will discuss the history of Portland's Urban Forestry Division, the Urban Forestry Commission and goals for the future. Learn about Hoyt's exceptional magnolia collection. Meet at noon at the Visitor Center for a guided tour of the blooming magnolias, which are just a short walk down the hill. Wear comfy walking shoes and bring a jacket, camera and water. Family-friendly. No registration required. Volunteer to plant and mulch trees throughout the Arboretum. Curator Martin Nicholson will be on hand to lend his expertise and guide the work party. Wear work clothes such as pants and boots. Be sure to dress for the weather and bring water and a snack. Gloves and tools will be provided. Meet at the Visitor Center. No registration required. Spend the afternoon with tree aficionado Phyllis Reynolds as she discusses the new edition of Trees of Greater Portland. First published in 1993, the new edition of the book lists new trees and provides updates on all the original trees, finding that 75% of them are still standing. She'll share the stories of these local trees that are exceptional for their size, beauty, rarity and history. The Arbor Day Festival is the main celebration of Arbor Month! Join Portland Parks & Recreation and Hoyt Arboretum for a fun-filled day honoring those who work tirelessly to enhance Portland's urban forest. Find more Arbor Day events, tours, lectures and volunteer opportunities on Hoyt Arboretum's online calendar of events or call 503-823-1649. To learn about more city-wide Arbor Day events, click on the City of Portland Arbor Month Calendar.